Trump clearly did the right thing, in firing the FBI Director, especially in that Comey repeatedly proved that justice isn’t at all blind, especially when it comes to the illuminated ones of the upper political class. Under the circumstances, if Hillary walks free from her mishandling of classified material, then any and all US government employees, especially those of the armed forces, should also be allowed to walk free, if convicted for the same or similar offences. President Trump has fired FBI Director James B. Comey, saying that the dramatic move was necessary to allow a “new beginning” at the FBI. Comey has been supervising an investigation of Russia’s meddling in the 2016 election and the possibility of cooperation between people linked to Trump’s campaign and Moscow. The FBI director also has been widely criticized by people in both parties for his handling of investigations connected to the election – the Russia investigation as well as the inquiry into Hillary Clinton’s email practices while she was secretary of State. In firing Comey, Trump said he had acted on the recommendation of Deputy Atty. Gen. Rod Rosenstein, a career prosecutor who is overseeing the FBI’s handling of the Russia investigation because Atty. Gen. Jeff Sessions has stepped aside from any role in it. In a memorandum to Sessions, which was released by the White House, Rosenstein harshly criticized Comey for his actions going to back to last July, when he held a news conference to announce that the FBI would not seek charges against Clinton in the email investigation but denounced her conduct. 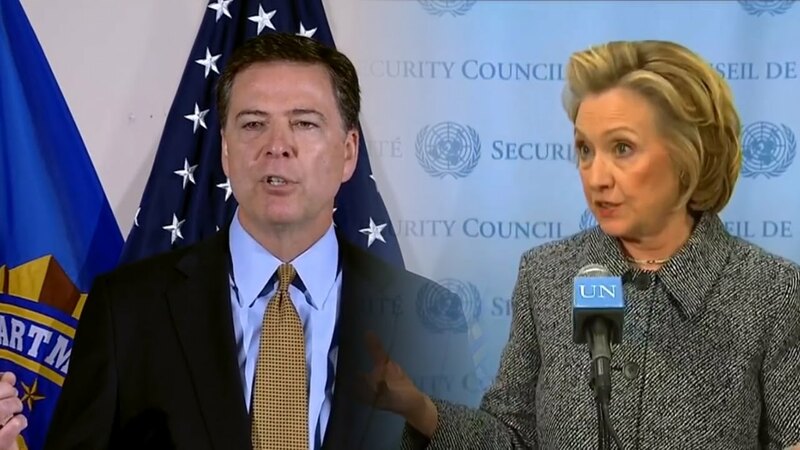 He went on to say that Comey had made the problems worse with his decision to disclose in late October - 11 days before the election - that the FBI had reopened its investigation of Clinton after finding State Department emails on a computer belonging to former Rep. Anthony Weiner, the estranged husband of Clinton’s aide, Huma Abedin. Clinton has blamed the Comey letter for contributing to her defeat, although polling evidence on that point is unclear. Comey told the Senate Judiciary Committee last week that he had no choice but to disclose the re-opened investigation and not “conceal” it. Rosenstein sharply disagreed. Given Comey’s actions and his refusal to admit that they were mistakes, “the FBI is unlikely to regain public and congressional trust until it has a director who understands the gravity of the mistakes and pledges never to repeat them,” Rosenstein wrote. Sessions, in a letter to Trump, said that he was recommending Comey’s dismissal “for the reasons expressed” by the deputy attorney general and in order for the department to “clearly reaffirm its commitment to longstanding principles” of proper conduct by investigators.